Just returned from travels in Spain and I was reminded of the lovely fresh salads and seafood combinations that I just don't take advantage of enough! Here's a lovely combination of salad, fruit and seafood which I hope you'll love! In saucepan, combine first 3 ingredients with water. Heat until boiling, then simmer 1 minute. Add prawns and cook until tender, 2 to 3 minutes. Drain and cool. Peel prawns, halve lengthwise, and discard the veins. In a small bowl, whisk together curry powder, water, cider vinegar and honey until honey dissolves. Whisk in mayonnaise. 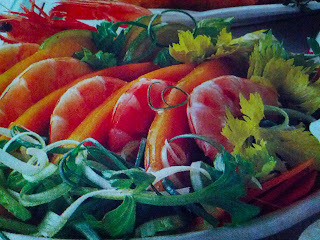 To serve, arrange lettuce or greens, the prawns and pawpaw on chilled plates. Dollop with mayonnaise mixture to taste.